As a follow-up to my previous post where I estimated the bill sizes for delivery in various hospitals in Singapore, before deciding to go with Thomson Medical Centre given their affordability and other reasons detailed here. Gynae and anaesthetist fees have been excluded from the comparison as these service fees vary according to the professionals who are charging them. 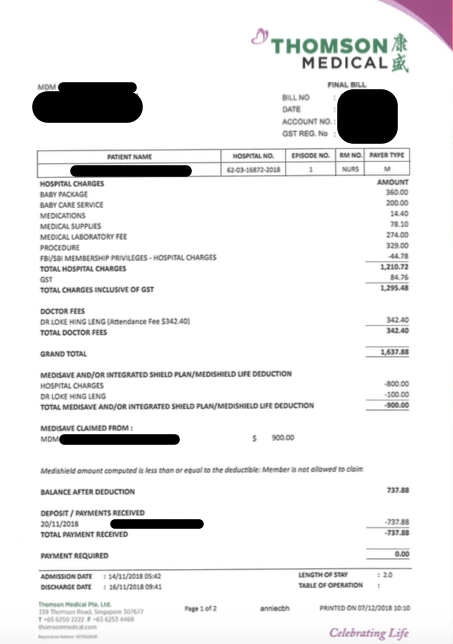 Between the few of us, our gynae fees ranged from $2000 - $3500, whereas the anaesthetist fees were from $700 - $775. Do note that your choice of gynae and anaesthetist will also determine whether your final bill paid to the hospital is on the higher or lower end, as the hospital collects the fees on the doctors' behalf. Similarly, I've excluded paediatrician fees as the charges varied from $300 - $900+ for the bills I studied. Note that PD fees will depend on the PD you choose, and expect to pay more for the more popular ones. 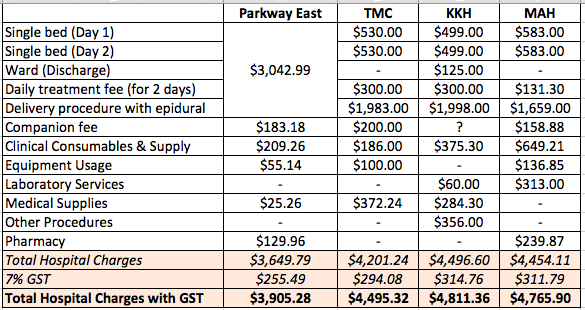 In my previous post using estimates, I actually predicted that the order from most affordable to most expensive would be Parkway East --> KKH --> TMC -- MAH, but as it turned out, the results were surprising. *** TMC has $100 less from the total combined bill due to their FBI discount, which was not included in my first table (due to them being the only hospital transparently showing that line item). My friend's MAH bill already included the $100 discount off charges after her Ladies Card discount, so I was not able to see what was the original before when comparing. The key observation I realised was that while MAH may seem to have a cheaper quote for their single room package, the actual bill differed by a large margin. I'm not too sure why, but based on the two MAH bills I've studied, it seems like their consumables are charged at a much higher rate? At the end of the day, do also note that the amount and type of consumables you utilise during your hospital stay may differ as every patient is different. 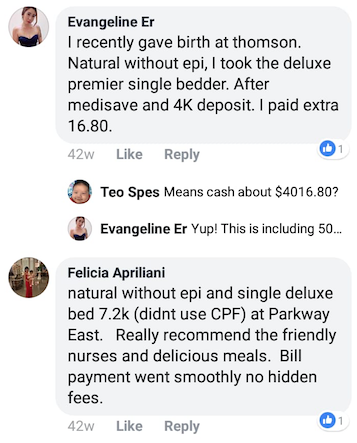 Evangeline's bill seems to suggest her TMC bill was approximately $6.5k (after you add back the MediSave), whereas Felicia's bill works out to be $7.2k. 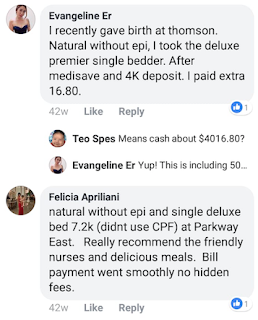 Unless the latter had a much gynae who charged $1000+ more for the same procedure (natural without epidural), it also seems like TMC might just be quite comparable to PEH's charges as well in terms of affordability. Anyway, if you were wondering whether going with KKH as a private patient will definitely be cheaper, I hope this article dispels that notion that it isn't necessarily so. Much of it also depends on your gynae / anaesthetist / PD fees and how smoothly / complicated your delivery ends up being. My friends who have delivered at KKH recently had their total bills range from $10k to $12k for a normal delivery. In fact, one of my friends who had previously delivered at KKH slightly over a year ago, has now decided to go with TMC for the delivery of their second kid, given that the prices don't really differ by much! Our out-of-pocket cash expenses ended up being about $6000, which was much lesser than I had budgeted for initially (we had saved for the worst-case scenario: an emergency C-section, and I highly encourage that everyone do so because you really cannot predict what will happen during delivery). On this aspect, we got lucky as I had a really smooth and short labour (9 hours in total). The detailed itemised bill breakdown arrived in the mail about two weeks after I was discharged, and there wasn't any surprising hidden fees so I'm quite pleased about their transparency on this front. I also received TMC's Breastfeeding Essentials discharge bag (which I raved about in my previous article), and it is a gorgeous sleek diaper bag that I can foresee myself using for sure! Call me superficial, but I'm mighty pleased with my TMC discharge bag by far. 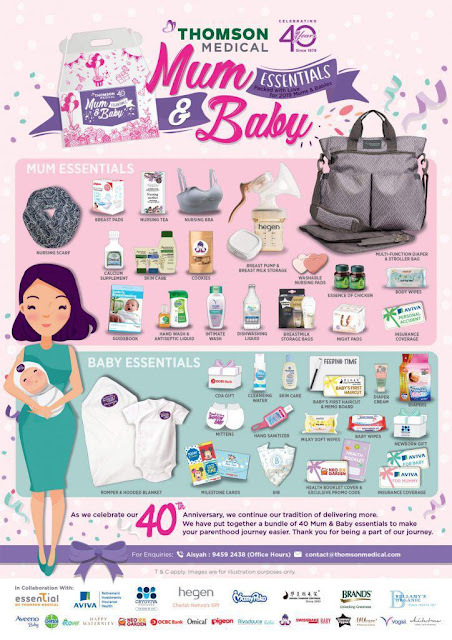 Not only are the items super useful (I mean, a branded Hegen breastfeeding pump?! And calcium supplements? And breast pads? And milk boosting tea? And a nursing cover? 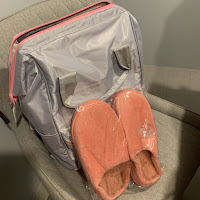 I could go on and on, you get my gist), I'm a suckler for the gorgeous black design of TMC's diaper bag as well. 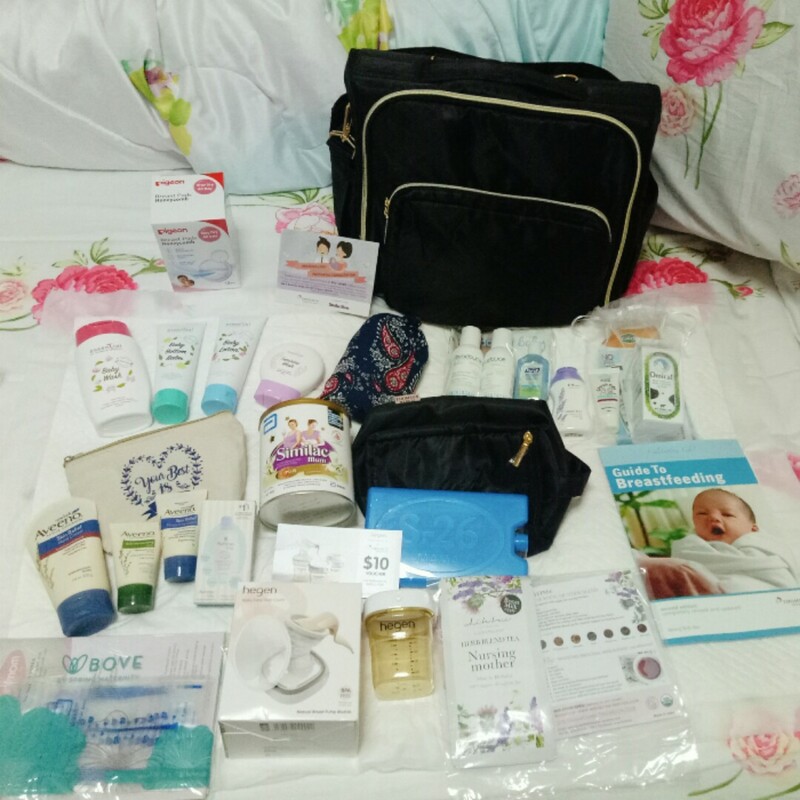 This goodie bag makes me somewhat wish my baby was born in December or 2019 instead, LOL! TMC has truly outdone themselves this time. I mean, a nursing bra?! And milk-boosting cookies by Singapore Lactation Bakes, which I'm also currently taking to boost my breastmilk supply?! And chicken essence!? And diapers?! And mittens?! And a baby bib?! I'm betting this new bag of goodies cost at least $300+.What a steal! When it is time for my second kid, I'll most probably go back to TMC again for my delivery. They've given me nothing but a great experience for my firstborn. P.S. Carpark issues? We visited TMC on various days and at various timings (1pm, 4pm, 10am and 12 midnight) and had no problems on all our visits, so there weren't any concerns for us at all. Disclaimer: During my stay, I was upgraded from a single room to a Premier Single by Thomson Medical Centre for my delivery due to availability. Bill sizes frequently differ due to mostly gynae operation fees. Hospital packages form about half of the equation (sometimes lesser, depending on your gynae fees). 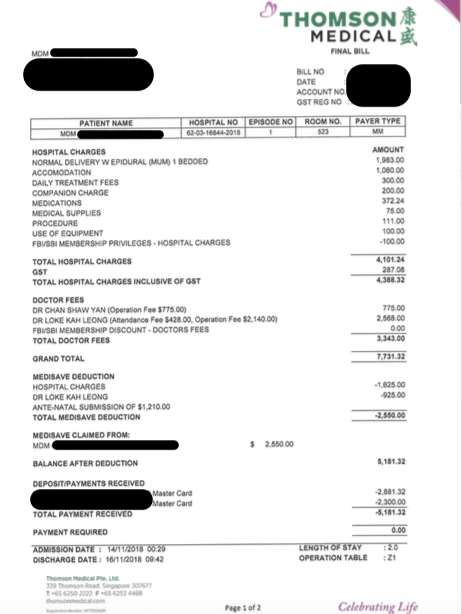 The bill comparison between the four hospitals here are based on the bills I received from my friends who delivered during a similar period as me but may not be indicative of all bills, so I highly recommend that you book a hospital tour and get a bill estimate directly if you're unsure. You can view my TMC hospital tour here. 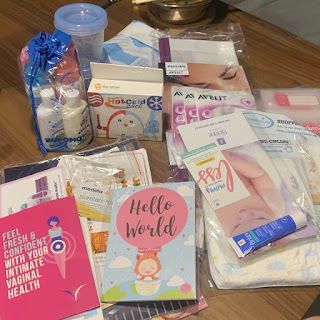 A huge thank you to Allison aka Heartland Boy, Elaine, Estee and Karen for sharing your actual bills and parenthood journey with me as we all become first-time parents! Hi, congrats on your newborn! Just wondering about the fees between TMC and MAH. Our gynae at ACJ Clinic recently moved from TMC to MAH and we compared the packages from both hospitals. We found that MAH is slightly cheaper! And thus we reserved a package there. Not sure how the total bill will turn out in the end, so we shall see..
Also, from your tables on Mummy's bill and Baby's bill, if I were to add the total from MAH and TMC, they are quite comparable (TMC: 5838, MAH: 5821). However, I can't draw the same conclusion when i look at the third table where there is a $300 difference. Is the data used in the tables the same? TMC is $4495.32+$1343.39-$100 (FBI discount off single-bedder). my friend's MAH bill already accounted for the $100 in her Ladies Card discount so I didn't have to deduct from her bill (only TMC showed clearly the line item being deducted, MAH's didn't). so that's $5738, cheaper than MAH. best to compare when it's closer to your actual delivery as the charges may have changed. for instance, the quote I got from MAH this year was different from the one my friend was quoted a few years ago when she delivered there. however, ! I would warrant a guess that MAH might still be more expensive though. 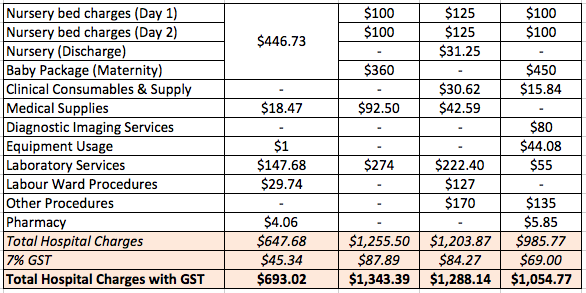 what I realised is that their packages and quotations tend to be cheaper, but the actual is much higher (looks like they charge more for consumables) - refer to the table's breakdown to compare and decide for yourself. I've also have updated the post to show the discrepancy between what was quoted and what the actual bill was! MAH's bill had a huge 4-digit discrepancy, whereas Parkway and TMC is just $100 - $200 different from the actual quote I received when I was sourcing around (my gynae delivers at all three private hospitals). My wife's bill is about $20,000+ before deduction! Just the delivery already cost $10,000+! was it because it was emergency C-section, after attempt of normal delivery with epidural? or due to hefty gynae / PD / NICU fees? otherwise, I'd be really shocked if your wife's bill was $20k for a normal delivery with epidural (the ones I compared in this article)!!!!! that's so much more than all of ours!?!? KKH does not have a separate gynae bill, so KKh is definitely cheaper as it does not have the additional $3000 compared to the rest. Our total bill was 10,000 and that was an emergency c-section. total cash outlay was about 5k. my friend's KKH bill was comparable to ours though for normal delivery as well, when I was expecting it to be A LOT cheaper! Hi Wanguin, which part of the additional $3000 you referring to?